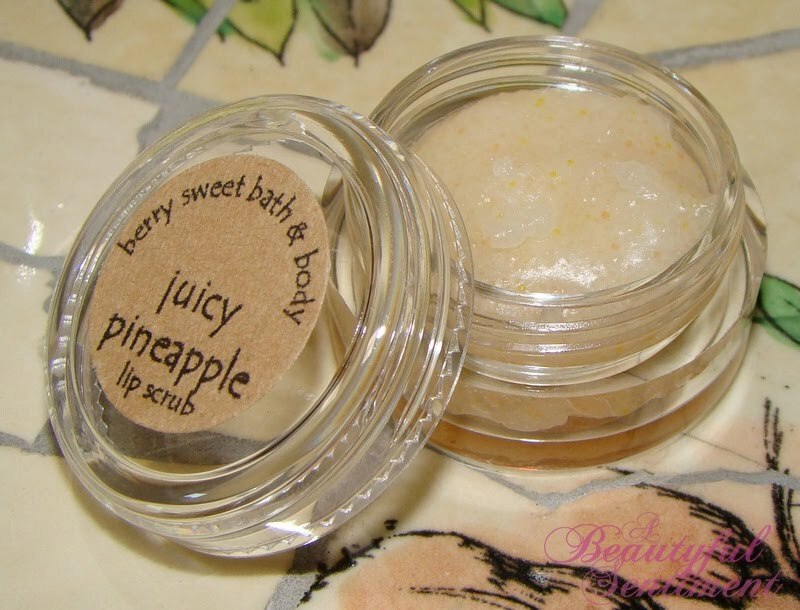 So the other day I blogged about Berry Sweet Bath & Body’s lip balms, and while I do really like them, my favorite product from this line is by far this Juicy Pineapple Lip Scrub. 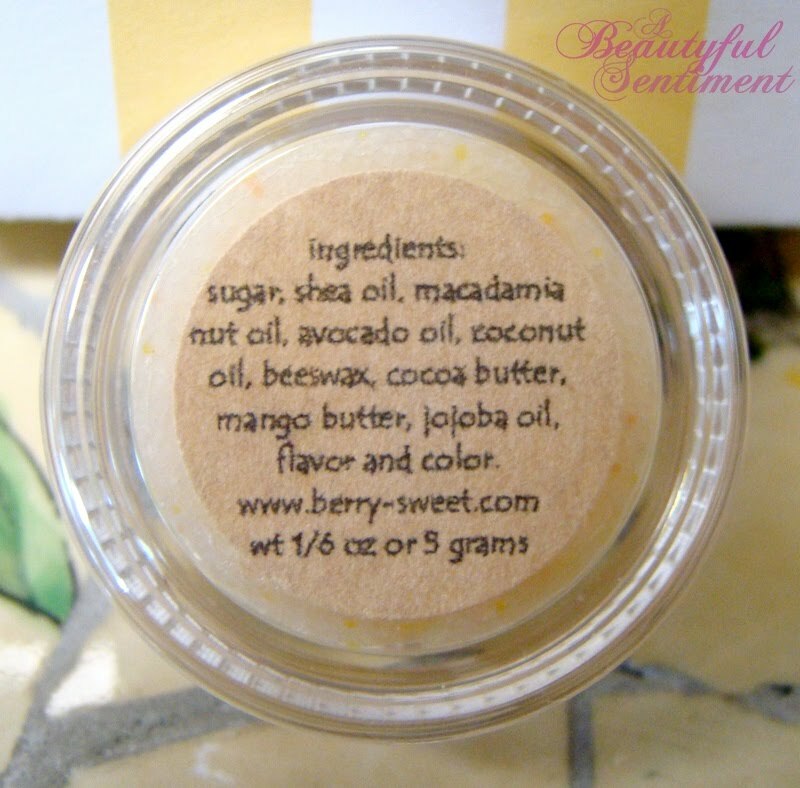 Not only does it contain some great exfoliating and moisturizing ingredients such sugar, shea, macadamia nut oil, mango butter and other goodies, but it also smells amazingly delicious – to the point that every once in awhile I’ll take a little nibble of the products while it’s on my lips =P. More photos and details after the jump! Blogger Charm Candy sent me this fun package full of Berry Sweet Bath & Body products, which are all produced in Hawaii, and the lip scrub came in the cutest candy-shaped tube along with a coordinating piece ‘o cake mango butter balm. The pineapple scent of this scrub is seriously just heavenly – it literally makes my mouth water every time I pop it open, and I know I shouldn’t, but I just can’t resist eating =X. Okay all weirdness aside, it really does leave my lips really smooth and soft and wonderfully exfoliating. Do check it out berrysweetbath.livejournal.com or reach them via e-mail at carri@berry-sweet.com. All this cuteness was a gift from fellow blogger, Charm Candy. Thanks so much Tori, I had so much playing with (and eating LOL) these delicious products! 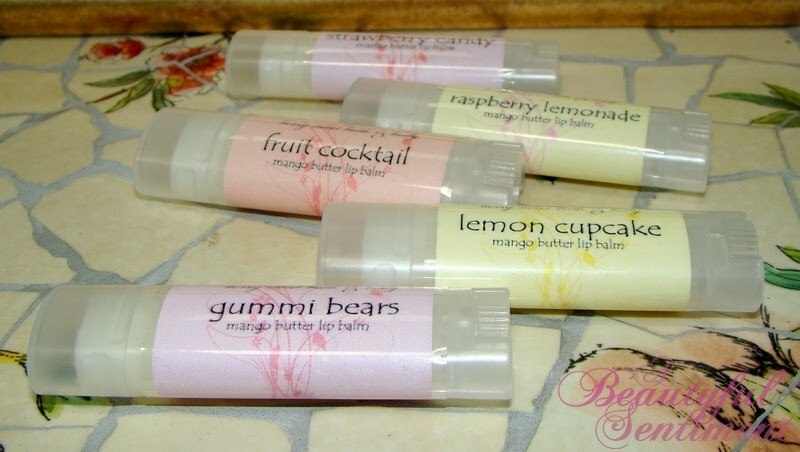 Berry Sweet’s Bath & Body Mango Butter Lip Balms (made in gorgeous Hawaii) are delicious treats for your lips (and fantastic stocking stuffers) that won’t break the bank. Containing coconut, shea, macadamia nut, avocado and sweet almond oils in addition to mango butter, these balms come packaged in fun slightly flattened oval tubes and are available in a myriad of flavor combinations. So far I’ve tried Gummi Bears, Lemon Cupcake, Fruit Cocktail, Raspberry Lemonade and Strawberry Candy and while they’re all just deliciously scrumptious, my favorite at the moment is Raspberry Lemonade. These light balms are great on their own, but are really just perfect for slicking on under your favorite lipstick or gloss for that extra layer of protection that we all need when the weather turns chilly. 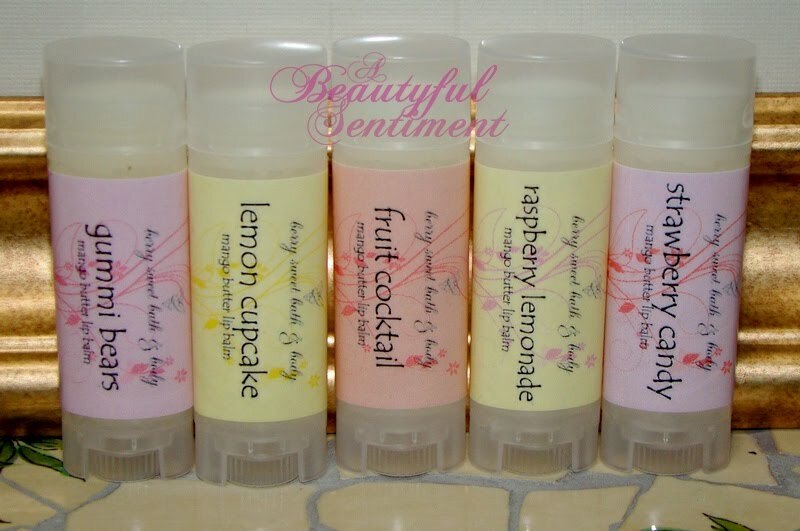 I really love the packaging on these balms and I’m really hoping that Berry Sweet Bath & Body founder, Carri Kaneshiro, will launch an Etsy or other web shop so that I can check out more of her products. For now you can find her at berrysweetbath.livejournal.com or via e-mail at carri@berry-sweet.com. Thanks so much to Charm Candy for sending me these wonderful little pieces of Hawaiian goodness, you’re too sweet! These products were a very sweet gift from a fabulous fellow blogger. I’m blessed to have met so many wonderful individuals through ABS! They’re constantly turning me onto new products that I’d never discover otherwise.